Waterfront property on Awahuri - the bend of the river as it comes out of Lake Taupo. Sleeps 10 -14. Newly built large home. Amazing views of the river. Full of character and ambience. Fantastic Chefs kitchen, dining and sitting areas all with views. Great year round retreat for ski/snowboard holidays, summer swimming in crystal clear river waters, BBQ's or just a relaxing blissfull holiday. Very sunny, warm and inviting. Large wood burner fireplace. Close to ski fields, hot pools, bush walks, mountain bike tracks etc. All bedrooms have views. 3 bedrooms on main level. 2 bedrooms in downstairs flat (available if needed for numbers more than 6).$70 per extra person per night over the base of 4. Lots of land and outdoor space. Plenty of room for cars, boat etc. 3-4 minutes drive to town, 10-15 minute walk to town along the river. Very close to Huka Falls, town, lake, hot pools and all activities. Great spot in summer and winter too. Approx 1 hr to Whakapapa ski fields and National park. River swimming - children must be supervised. Pets maybe allowed with prior approval - outside only. Stairways, unguarded firebox, not toddler proof. Grew up in Taupo. Now built on old family land beside the river. Chefs Kitchen with open plan dining and living. Great indoor outdoor flow. Large house, spacious garden. All overlooking lovely views of the river! Fantastic swimming in the crystal clear waters of the river as it comes off lake Taupo! 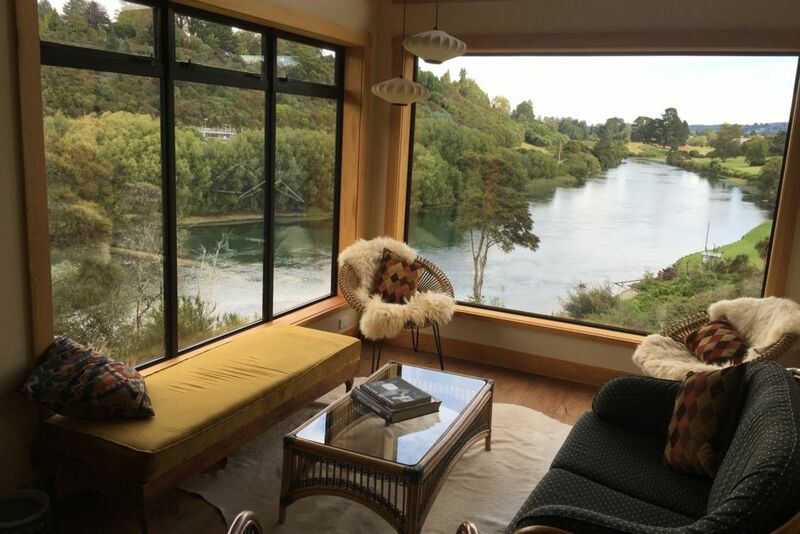 Set right on the bend of the waikato river just after it leaves lake Taupo, where the water is crystal clear and the views are both up and down river...Spectac! 2 great living areas plus numerous out door areas to sit alfresco and soak up the veiws. May use our pantry items. large dining table with 8 chairs. Other usable chairs around. Take a Kayak trip down river with one of the companies from town or byo Kayak...but stop at reids farm. do not go as far as Huka falls. Byo ski's and snow board to make use of fields approx 1 hr away. Near by tennis courts in town. Lots of outdoor swimming in the River! We went as a 3 generational family of 8 to Rangatira Park and had a wonderful time. The house was absolutely luxurious with river or garden views from every window. There were so many treasures inside and everything was available for us to use. We enjoyed barbecues, the wood fire, playing croquet and hide and seek. The walk to town along the river was another highlight. Just perfect! We had an amazing time away. This property has everything lots of space quite and some luxury things. Would stay again with a big group of people for sure. The fire was more than enough to keep the place warm. Views were out standing as well. The only negative was the bbq we couldn't use due to it having mold on it, but the oven and stove inside is really good so didn't need it. The bed down stairs in the flat is really not the best, its supper low and really soft. Stunningly designed is right! Views, beautiful warm sunny house - we LOVED it. Sally was a great host. This is the most special place we've stayed in, a destination on its own, never mind proximity to all Taupo has to offer. The only downside was that we didn't plan to stay longer. This property was absolutely perfect for our requirements. This property was absolutely perfect for our requirements. It housed 4 couples comfortably with room to spare. We stayed in and cooked in the superbly kitted out kitchen (no microwave) and the log fire was fabulous. Easy walk into town and lovely views from the house. Really wished we could have stayed longer, and will definitely try another family get-together here in summer next time. Only word of warning - try and get there during daylight, the lane is tricky to find at night.